It's actually seven if you include Flash. Ho ho! Portable Wi-Fi hotspots, please, Apple! In news that's surprised absolutely nobody, Google has taken the wraps off Froyo, or Android 2.2 as it's officially known. It's a minor update rather than an awesome new version, but there's still lots to like - and there are even a few ideas we'd love to see Google's arch-enemy nick. We wouldn't recommend nicking the interface, though: while the forthcoming iPhone 4.0 OS looks a bit Fisher-Price to us - we're not sold on the redesigned home screen at all - it's still a work of art compared to Google's effort. Google doesn't really do interfaces - Chrome works because there's hardly any interface to mess up - and there's a reason why you only ever see HTC's Sense UI in Android ads. Sure, you can customise the way Android looks, but to us that's rather like painting stripes on a donkey and telling everybody it's a zebra. So what should Mr Jobs steal? Free turn-by-turn navigation is a pretty big selling point, and while an Apple equivalent would really annoy TomTom (and the other sat-nav firms in the App store) we're talking about a firm that will happily and publicly pick fights with Adobe, so TomTom's feelings probably don't matter much. While we're on the subject of Adobe, Android of course does Flash. You're wasting your breath asking Steve for that one. What else? We'll have some Wi-Fi syncing, thank you very much - demanding a cable to update your address book is so 2001; MobileMe costs money so it doesn't count - and if you're American, you might want to ask Apple about tethering your iPhone to use it as a modem. Yes, we've seen screenshots suggesting that AT&T tethering is coming, but we won't believe it until there's evidence of real iPhone owners using it in the wild while beaming AT&T execs clap happily. What's better than tethering? That's right! Portable Wi-Fi hotspots! Android's ability to turn selected handsets into portable Wi-Fi access points is inspired and useful, and if Apple stuck it into the iPhone it would kill sales of its pricey 3G-enabled iPad. So that one's not going to happen. Neither is an open App Store, where you can download anything you want without running it past Steve Jobs first. Last but not least - you've guessed it - there's multitasking. 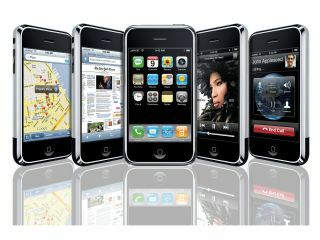 Apple's approach in iPhone OS 4.0 is to offer pseudo-multitasking, not proper multitasking, and as gadget geeks we like Android's "it's your phone so it's up to you what you run" approach. Sure, it kills the battery in no time, but hey! It's our battery!